Installing new kitchen cabinets can be one of the most expensive projects in a kitchen remodel. Typically, the cost of cabinets can account for as much as 20-30% of the total renovation budget. 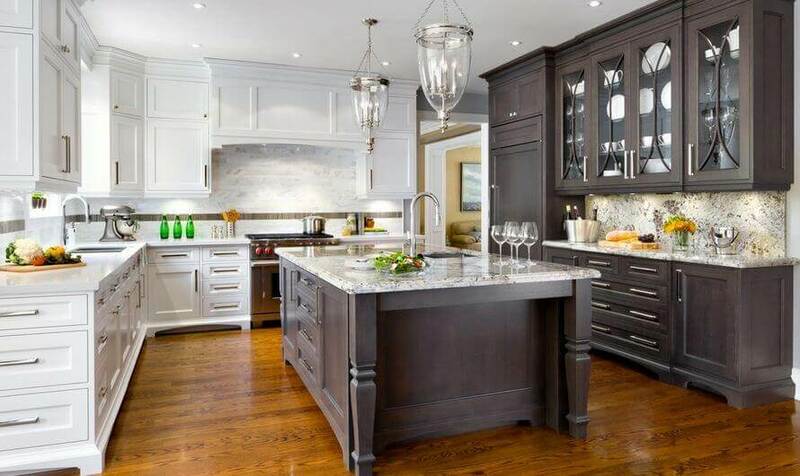 Lets take an in-depth look at different options for kitchen cabinetry and how much they cost. Stock ($60-220 per linear foot) – these is the most budget friendly option. They are completely prefabricated and are available for installation immediately. You can find dozens of stock kitchen cabinets designs and styles in big home improvement stores such as Home Depot and IKEA. Semi-custom ($100 – 600 per linear foot) – these are a middle of the road option that affords a great deal of customization. While the bulk of the cabinetry is already prefabricated, there are many pieces that you can pick and choose to create a unique look. These cabinets also give you flexibility in terms of functionality and storage that you want to have in your kitchen. Custom ($550-1,300 per linear foot) – these are high-end cabinets that are usually installed in luxury properties. All pieces are custom made according to your specifications. These cabinets can be extremely helpful for people with mobility and accessibility challenges. As a rule of thumb, these kitchen cabinets are made of solid wood. Prepare to wait for at least 6-8 weeks to receive your finished cabinetry. 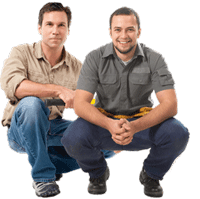 In addition to the cabinets themselves, you will need to hire a pro to install them. Across the US, kitchen installers charge $65-110 per hour for their labor. This range in pricing depends on the area you live in and local contractor rates. Places like Boston, New York, San Francisco, with a higher standard of living and property values have pros that charge higher rates for remodeling work. Many people assume that stock or prefabricated cabinetry automatically equals cheap looks and poor craftsmanship. However, that is not necessarily true. All stock cabinetry is available in traditional, country, shaker, or contemporary designs. There is also a wide selection of colors, from classic whites to grey and black, as well as natural wood. On the downside, stock cabinets are limited in terms of sizes, and there are no customization options. What you see is what you get. Standard width for stock cabinets starts at 9″ with 3″ increments and goes to 48″. Standard depth is 12″ for wall cabinets and 24″ for oven, base, and utility cabinets. Depending on how much you want to spend there is a great range both in quality and style of stock cabinets. For example, in IKEA you have the VEDDINGE line, where a cabinet door costs $20. At the same time, you can install the VOXTORP line, where a door costs $118. Obviously, when finished these two kitchens will look very different. In general, IKEA cabinet designs cater to a more modern aesthetic. 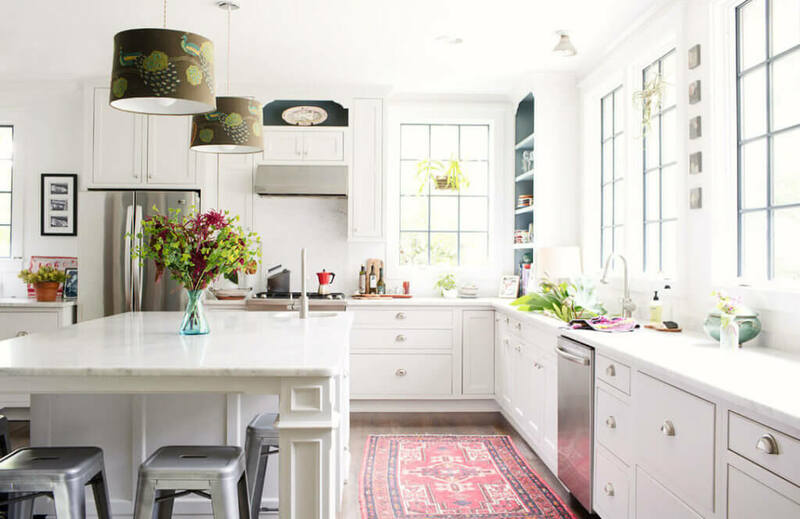 While there are some traditional looking kitchens, you will find a lot more contemporary styles here. Typically, big box stores, like Home Depot and Lowe’s, will have more traditional design choices for stock cabinetry than IKEA. However, they also tend to cost 15-25% more. For example, the cheapest stock kitchen by Hampton Bay (white satin) 10×10 layout starts at $1,480. Most of their other kitchens start at over $2,000 for a 10×10 layout. If you are on a very tight budget, you can also look for stock cabinets in various home improvement outlets. For example, here in MA, we have Bargain Outlet, and we got our white shaker kitchen there for about $35 per linear foot. To stay within your budget, use our Kitchen Remodel Calculator and figure out exactly where you want to spend the money. Semi-custom cabinets are essentially a compromise between stock and custom options. They are manufactured the same way as stock cabinetry, but you have the option to change many of the design details and dimensions, according to your needs. You can choose from dozens of stains, finishes, paints, door designs, organizational inserts, moldings and hardware options. Depending on the modifications you are looking to make, lead time can be 4-8 weeks. Still, you will receive your new cabinets much faster, compared to a fully customized option. There are many semi-custom cabinet manufacturers to consider. Its best to go to a kitchen showroom as opposed to a big box store, like Home Depot, to compare different brands. Shiloh Cabinetry and KraftMaid are known for their high quality and beautiful design options. In terms of materials, you can expect cheaper products to be made from MDF (medium density fiberboard) and covered with a surface veneer. More expensive products will be made from solid wood. Custom kitchen cabinets are the creme de la creme of all cabinet options. This is precisely why they are typically used in high-end kitchen remodels. With these cabinets, everything is made according to your specifications. You select the cabinet size, configuration, wood type, color, style, finish, level of detail, etc. Because they are made by expert carpenters, it can take as long as 3-5 months to get them. Moreover, the best quality materials are used (the body, drawers and shelves, as well as cabinet doors). As a result, custom cabinets last for decades. They are extremely durable, and can take very heavy use without loosing their aesthetic appeal or functionality. So you really have to ask yourself: do I have this kind of budget and is it worth it? Typically, kitchen designers recommend installing custom kitchen cabinetry in homes whose value exceeds $500,000. Another consideration is whether you are gutting the entire kitchen, and starting the design from scratch. 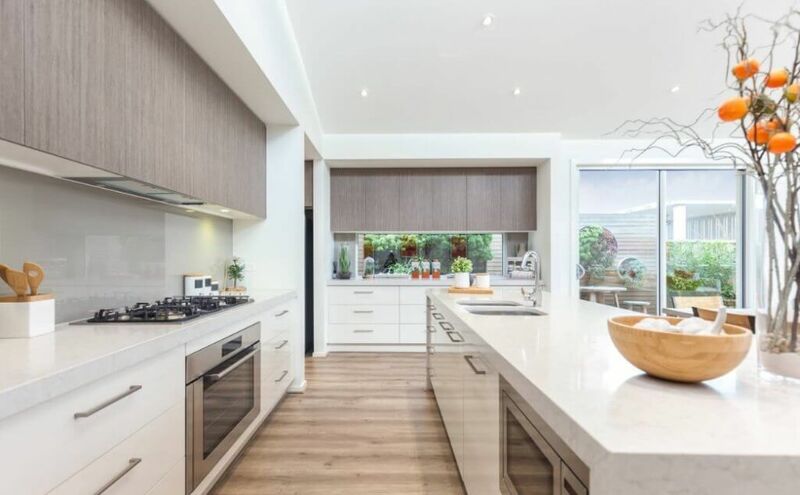 When selecting kitchen cabinets, its important to consider the quality and durability of the materials that the cabinet itself, not just the exterior surface is made from. This can have a great impact on how long the cabinets will last, as well as the total cost. The highest quality cabinets are made from solid wood. Typically, there are about 25 wood species to choose from, but the most popular are oak, cherry, maple, hickory, ash, birch and pine. Its important to note, that even in the most expensive cabinets, solid wood is used to build the cabinet frame, and the door, NOT the box itself. Because wood is very heavy and tend to expand and contract with temperature fluctuations, the cabinet box made of real wood would warp and shift over time, so its not practical to use this material. A step down, but still used in high-end cabinets is plywood. Its not uncommon for cabinet manufacturers to charge about a 15-20% premium of cabinets that are made from full plywood. Its produced by taking thin sheets of wood, layering them and gluing them together under high pressure. As a result, plywood has superior strength, is resistant to denting, warping, and sagging. Thicker plywood panels offer more strength and durability, so its best to install those. Overall, plywood the top recommended material for the cabinet box, shelving, and drawer bottoms. Most mid-range semi-custom cabinets are made from a composite fiberboard, known as MDF. This is an engineered product that is manufactured using high pressure equipment that binds together glue and very fine fibers of wood. While not ideal for construction of the frame, MDF is not a bad choice for doors, especially if you want them painted. This is because MDF is better at preventing paint cracks, compared to wood or plywood. Most IKEA cabinets are made of MDF. You should be aware that there is a health concern related to installing composites, such as MDF, because this material is known to contain dangerous urea-formaldehyde. This is a highly toxic substance that may cause coughing, allergies and other symptoms to people that are exposed to it. Of all the pressed wood materials that are used in kitchen cabinetry, MDF is known to emit the highest levels of urea-formaldehyde. Particleboard (low density fiberboard or chipboard) is another pressed composite material. Unlike in MDF, a combination of wood shavings, chips and sawdust is glued together under high pressure. Particleboard is the cheapest, but also least durable of all cabinet materials. Its prone to moisture, and tends to sag if used for shelving and drawer bottoms. You will find it used extensively in the budget cabinet lines. Its best to avoid cabinetry that makes use of particleboard, if you can afford a more durable material. Today, there are multiple surface materials that can be used in cabinet construction. While staining or painting solid wood or plywood doors is the classic option, there are many more to consider. Most popular are painted MDF doors, real wood veneer, laminate veneer, thermofoil and polyethelene surfaces. Each one has its pros and cons that should be carefully considered. Many of these high-end veneers offer both durability and a unique modern aesthetic, which can be a refreshing alternative to the look of solid wood. If you are debating between installing real wood or laminate cabinets, its important to weigh the lower cost of laminate against shorter life span, as well as limited repair options, compared to wood. Note, laminate is the surface veneer layer of the cabinet doors. Its not the material used to construct the cabinet box, framing, or shelving. In general, wood cabinets can last at least 3 times as long as laminate cabinets. Humidity and moisture are particularly dangerous to laminate material, because the glue that holds the the surface layer starts to wear off, causing ugly peeling. Bending and warping are also common issues. Once this process starts, there is really not much you can do to repair the cabinets. On the other hand, wear and tear on wood is not as noticeable, and there are a few repair options available, before going to complete replacement. For one, wood cabinets can easily be painted and updated with new hardware. This costs only a fraction of what you would be spending on a full replacement. Another factor to consider is resale value. If you are planning to sell your home in the next 5-7 years, its best to invest more into solid wood cabinets. They hold their value over time and offer a much better return on investment compared to laminate. 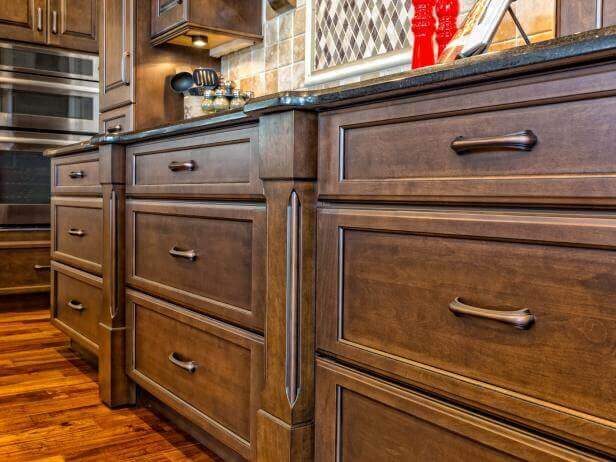 Moreover, most homeowners prefer to look and feel of wood cabinetry. The one area where laminate cabinets have a major advantage over wood is when it comes to clean up. Most kitchens are home to regular spills, food left overs, grease, dusts, etc, all of which leave stains on the cabinetry. Laminate is very easy to clean with just a damp cloth, while real wood is a lot more challenging. You need to use special cleaners to remove tough stains, dust and food crumbs, settle more easily and are harder to remove completely. If you are on a tight budget and are leaning toward laminate cabinets in order to save money, its best to select high-pressure, commercial grade laminate. They will be a bit more expensive, but they also look a lot more like real wood, and will last longer than lower grade laminate.